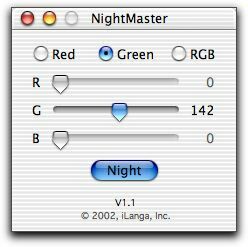 NightMaster is a small application that manipulates the gamma of your Macintosh screen to give you a "night vision" mode for astronomical applications that don't support this function. There is no manual or read-me file. Just double-click the application, choose the colour using the radio buttons and click the "Night" button. You can change colour and brightness using the sliders. Click the button again (it will now read "Day") to return to normal colours. The functionality of NightMaster is also built into AstroPlanner. NightMaster is Freeware. Use it at your own risk. If you would like to support my astronomy obsess..., er hobby, and feel this application has some value to you, I always gratefully accept donations. Creating software like this requires lots of time and expensive software and equipment. Note: Although NightMaster is freeware, please do not post the files anywhere else without permission. Feel free to point anybody at this page or publish the URL publicly. Added multiple colours, about window, saved values in preferences, etc.